SAINTFIELD Play Park has undergone a radical transformation thanks to funding from the Northern Ireland Rural Development Programme for rural Down, Ards, Banbridge, and North Down Council areas. At the launch of the new play area in Saintfield were Nicholas McCrickard, Manager for the County Down Rural Community Network, Cllr Maria McCarthy , Chair Down District Council, David Kerr, Chair Local Action Group, Down Rural Area Partnership Susan Welsh, Chairperson Saintfield Community Estates Partnership, Janine Connolly, Rural Development Officer County Down Rural Community Network, Marguerite Osborne, Programme Manager Down Rural Area Partnership. 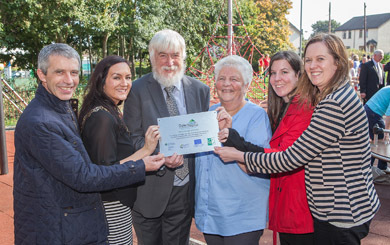 “This is down to the hard work of Saintfield Community Estates Partnership, Down District Council and the County Down Rural Community Network, who worked closely with the staff of Down Rural Area Partnership to make the project such a huge success. Over 50 children, parents, and community members gathered to mark the establishment of this wonderful new facility on Saturday 28 September at the official opening ceremony, officiated by Noel Lavery, Permanent Secretary for the Department for Agriculture and Rural Development (DARD). The occasion was marked with live music and refreshments, as children enjoyed playing in the new facility. 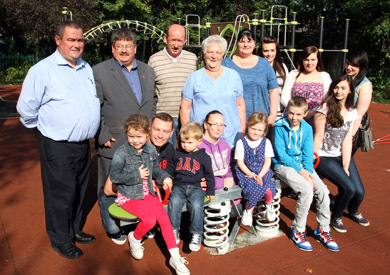 Parents and children at the new Saintfield playpark with Rowallene Councillors Billy Walker and Terry Andrews, and representatives of the Saintfield Estates Partnership Ltd, Raymond Cochrane and Sally Welsh (Chairperson). Speaking to Down News after the opening, Sally Welsh, Chairperson of the Saintfield Community Esrares partnership Ltd said that almost £100,ooo had been invested in the new playpark area. “It took us three years to get there but it was worth it in the end,” she said. ” We had to demonstrate a clear need for the project so we consulted widely with school and in the community. “We had already received funding for the lower section of the play area a few years ago and this stage will now complete the whole project so teenagers as well as younger children can enjoy themselves in a safe environment. The teenagers area fro 13+ children is used well. “The play area is for all children and their families and everyone is welcome. There is an excellent range of state-of-the-art equipment and the five-a-side soccer area is well used. We also have a sensory area where a child in a wheelchair can participate in play too. We even have a big swing they can enjoy.